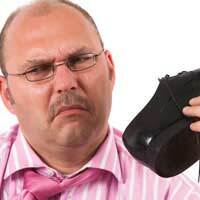 Feet naturally give off an odour because they are covered in sweat glands. The normal smell of sweat however should be unoffensive. Combined with bacteria sweat becomes a more pungent aroma, and this foul smell can be intensified further if there are other foot problems to take into consideration. A strong, unpleasant odour that is characterised by extreme secretion of sweat is known as bromidrosis. This offensive smell can be confined to one particular area of the body but may also be diffused over a larger surface of skin. It is the rapid decomposition of the perspiration secretion that creates the foul odour, even though the unpleasant smell may not be present initially. Otherwise clean and healthy feet may smell less than pleasant if a toenail infection is present. In severe toenail infections the nail will actually be separated from the nail bed, which results in potential further spreading of the foul smelling infection. This condition is known as onycholysis and is a painless but common problem that may result from injury, infection or skin disease. Several nails may be affected at once and this yeast and bacteria infection must be treated correctly in order to avoid permanent damage to the nail. Any pre-existing foot problem, and odour, can be made considerably worse by the presence of a fungal infection. The advancement of a common infection like Athlete’s Foot can create deterioration of the skin webbing between the toes, which can then lead to the cracking of the skin and a foul odour. It is generally recommended that to maintain good foot health we should alternate the shoes that we wear. By not wearing the same footwear continuously we are allowing our feet to breath, which minimises the chances of picking up an infection. Because it is important that feet are able to breath and feel air-conditioned, whilst enclosed in restrictive shoes, it is recommended that healthy shoes made of genuine leather, or skin-friendly fabric, should be worn. Feet-friendly footwear will help reduce the amount of perspiration that becomes secreted and this will help ensure feet remain pleasant smelling. Children are generally more active than adults and will therefore secrete more sweat in the footwear they choose to wear. Ensuring that children wash their feet carefully and regularly will minimise potential infections and will also help remove any nasty smelly feet odours. The taking of prescribed medication can taint the odour of an individual’s sweat. Any medication that increases sweating may encourage an over secretion of sweat in the glands of the foot. Hormonal changes can also create an imbalance that can result in an increase in sweat, and it is therefore recommended that steps are taken to minimise the potential of sweat build-up if you are experiencing hormonal problems. Eating lots of strong smelling foods like garlic will also affect the smell of an individual’s perspiration, and overall health can also impact on the natural smell of sweat.